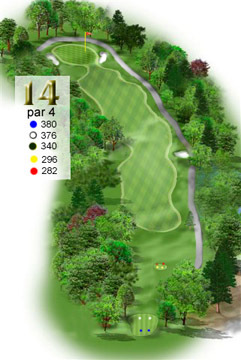 Par 4, dogleg left with trees everywhere. When you go back to the tees from the 13th green it won't take you long to realize how difficult this hole will be. The corner of trees on the left can block your second shot if you don't keep it in the center or to the right. This hole is all up hill and plays even longer than it looks and the green is well protected with font side bunkers.